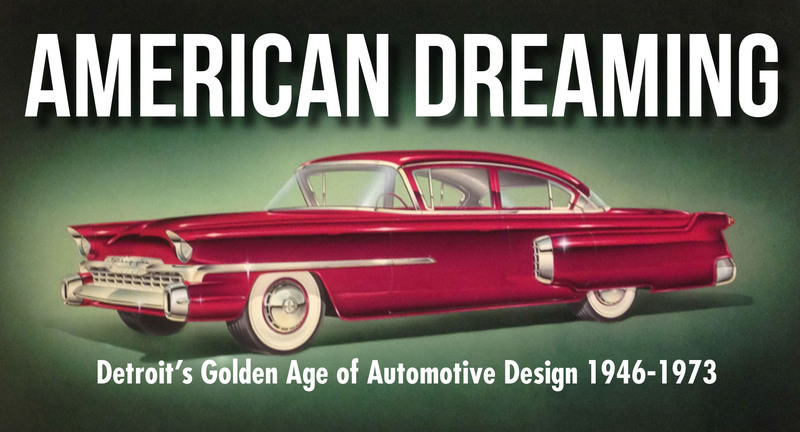 “American Dreaming: Detroit’s Golden Age of Automotive Design,” the first comprehensive exhibition to offer a look inside the design studios of Detroit’s automakers from 1946 to 1973, will run from April 17 to May 2 at Lawrence Technological University. The exhibition will be open 11 a.m. to 5 p.m. Monday through Saturday and from noon to 5 p.m. on Sundays in the gallery of LTU’s University Technology and Learning Center, 21000 West Ten Mile Road, Southfield. Admission is free. The exhibition kicks off with an opening reception on Friday, April 17, from 4-8 p.m. in the UTLC Gallery and lobby. Many retired automotive designers who have loaned their original art will be in attendance. This event is open to the public at no charge. On Wednesday, April 29, from 7-9 p.m. Keith Nagara, director of LTU’s transportation design program, will lead a panel of retired automotive designers and art historians in a discussion about the art of the automotive industry and its place in American art history. Admission is free to this program in the Architecture Building auditorium at Lawrence Tech. In an effort to gain market share in the post-World War II era, Detroit-based automakers hired university-trained artists to produce the most visually appealing cars. This was a time when styling and design were highly valued by automakers, and artists had the opportunity to shape the industry and change the look of the entire country. What makes this exhibition particularly remarkable is that the car company policies mandated preliminary artwork to be destroyed when the final designs were selected for production, so the vast majority of this artwork has disappeared. Sponsored by LTU’s College of Architecture and Design, the exhibition has been organized and curated by Robert Edwards and Greg Salustro, co-producers of a feature-length documentary film, “American Dreaming,” now in production. Salustro and Edwards, both native Detroiters, have been fascinated by these artists and their artwork and want share what they’ve discovered with fans of graphic art everywhere. Their forthcoming film features interviews with the designers whose creative imaginations launched the golden age of automotive Americana. “We want to shine a bright light into the world of Detroit’s automotive design studios and recognize the artists of this golden age of car design,” explained Edwards of Salustro/Edwards Productions. Artist Bill Brownlie of Briggs Design proposed this new body theme for the Packard Clipper, but it was never used. Chrysler acquired Briggs Design in 1953, and Brownlie worked on many of the iconic Chrysler models in the 1950s and 1960s.